At 21 years old, Marc Marquez has ticked off most boxes where bike racing is concerned. Lap records, race wins and a World Championship are all his already. 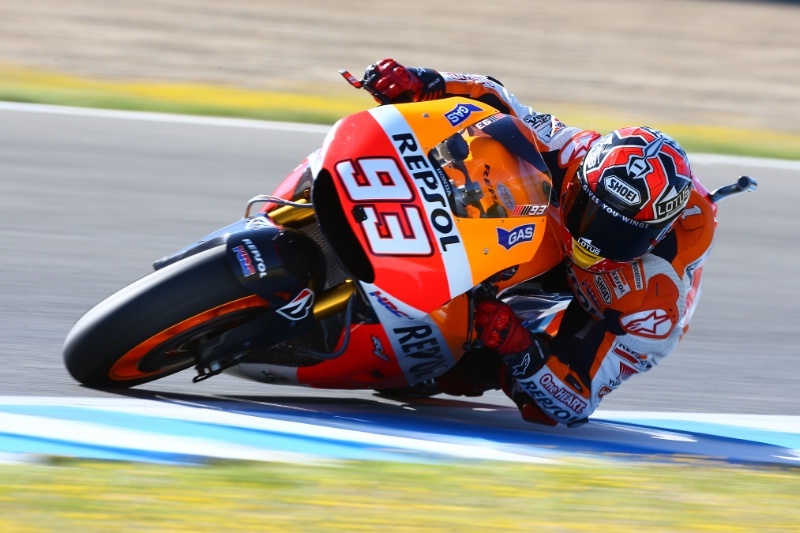 What Marquez lacked however, was a victory in the premier class at his home round in Jerez. Showing blistering performance from the get-go this year with a clean sheet of pole positions and race wins meant it would be madness to bet against him for another win at home. Sure enough the Spaniard continued to crush the hopes of the competition with a dominant performance in qualifying and it was looking as if he would do his usual disappearing act into the distance. When the lights went out it didn’t quite go that way, for two laps at least..
Andrea Dovizioso took the holeshot with Rossi and Lorenzo putting up a valiant effort to keep Marquez in sight but once MM93 saw open track at the end of lap two he stayed in front until the chequered flag. Marquez became the first rider to win the opening four rounds of the season since Valentino Rossi way back in 2002 and it also marked his 100th GP start. The battle for second was fought between the usual suspects of Pedrosa, Lorenzo and Rossi. Usually we’d see Pedrosa sneak into second spot and stay there without too much fuss. On this occasion Rossi showed a turn of speed that Pedrosa couldn’t match and Pedrosa was left to settle for third with Rossi on the second step of the podium. The race also saw plenty of non finishers including Ducati’s Cal Crutchlow who pulled in with brake failure on his Desmosedici after only three laps, a frustrating result on his first race back after injury meant he missed the last round in Argentina.